Tinnitus affects thousands of Aussies, but there are many who don’t know what it is or how it affects them. Statistically, 18% of Aussies are currently suffering. Causes differ based on region and personal inflictions, but roughly 5% is caused by joint pain in the jaw 1. As tinnitus severity increases, it can lead to hearing loss, or at the very least a reduction in hearing quality. But first we have to know what it really is, what are the symptoms, and how we can limit its long-term affects. We discuss more details further below. Tinnitus is commonly described as “ringing in the ears”. It can be either acute (temporary) or chronic (ongoing). The “ringing” comes even when there isn’t any actual sound happening. For example, while a room may be completely silent, with tinnitus you’d still hear a “ringing” in the ears. It can start small and remain virtually unnoticeable but, over time, it can become very loud. So loud, it causes difficulty when sleeping. And causes an increase of headaches. However, it can also be more than just ringing. It can also be described as buzzing, whooshing, clicking or hissing. And some reports (while rare) suggest that it sounds like music when no other music is playing. Although not as rabid here, Americans consider it as one of the most debilitating health conditions of the country. It’s estimated that 50 million people in the United states suffer the condition in some form with approximately 20 million suffering a chronic form, according to The U.S Centers of Disease control 2. 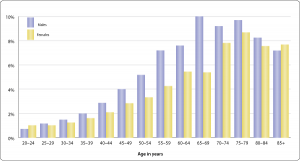 Here, a local study showed 22% of South Australians have hearing loss while 11% of those surveyed reported to having tinnitus 3. However, not everyone with problem has hearing loss. 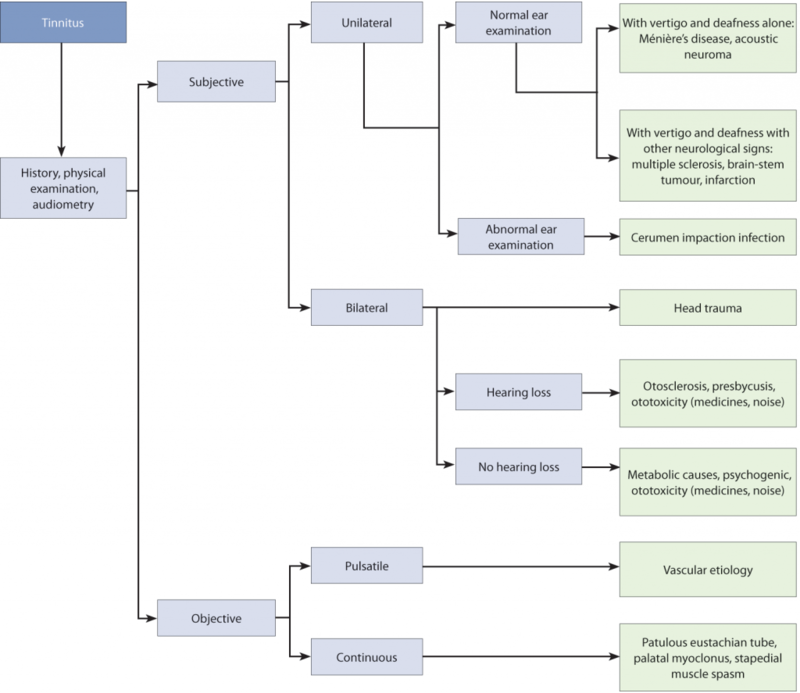 Subjective Tinnitus: More than 99% of reports are subjective tinnitus. It’s linked to hearing loss, specifically with auditory and neurological reactions. The sounds are within the head or the ear and only the patient hears them. Objective Tinnitus: Unlike subjective tinnitus, objective tinnitus is head or ear noises heard by the patient and This tinnitus is very rare (less than 1% of total cases report having objective tinnitus) and it’s caused by blood flow and somatic (musculoskeletal) movement. Musical: As mentioned above, patients sometimes hear their tinnitus as music. With musical tinnitus, they hear the looping of a specific melody, tune, or even voice. However, this is very rare. Pulsatile: This is similar to pulsing, like that of a heartbeat. It’s connected to objective tinnitus. Tonal: The tone heard fluctuates. It’s connected to subjective tinnitus. It is a continuous sound and the frequencies are well-defined 2. Although there’s no clinically-based cure for tinnitus, there are several measures that can be taken in order to prevent it from worsening or causing hearing loss over time 4. Tinnitus can cause poor concentration because the ringing is constant and distracting. The louder it becomes, the harder it can be to focus. Considering we often attempt to concentrate in quiet settings this is the exact scenario where it becomes more apparent. It’s the same for when we attempt to sleep at night. And if you feel you’ve yet to have a good night’s sleep in awhile due to tinnitus, you have a worse time concentrating the following day. It’s a never-ending cycle. Irritability, tension, mood swings, and even depression are a few of the ways in which it affects the body 5. Also, long-term exposure of tinnitus can lead to damage of the ear because it can get very loud. 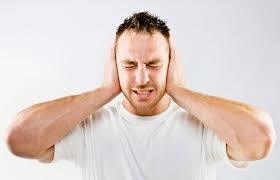 After hearing loud music, we can experience something similar to tinnitus called Temporary Threshold Shift (TTS). It’s a ringing, caused by loudness exposure, that eventually subsides as the hours pass. So, TTS has no long-term ill effects on our hearing. Tinnitus, on the other hand, can very well be long-term (or chronic) and that constant exposure is not good for our ears. Although tinnitus can be temporary, it can become chronic. At that point, it becomes a permanent problem. While there are hearing aids designed specifically to reduce the problems associated with tinnitus, there is no exact cure for the ringing. This is why we need to seek help to identify or correct the damage it causes to our ears as early as possible. Constant noise, even if it’s not excessive, can essentially “tire out” the ear. So giving it breaks every couple of hours is highly recommended. This means sitting in silence or in a very quiet area for awhile. We also know that as we age our hearing will deteriorate. This is just part of the ageing process. Trying to treat it without the help of a medical professional isn’t recommended. Although it may cause temporary relief it also has a chance of making your tinnitus worse. But even if you feel your hearing is perfect, it never hurts to go see an audiologist. The tests they conduct can detect hearing loss and gradual discomfort. The audiologist, backed by years of expertise and thorough knowledge, can provide guidance on how to manage tinnitus. Hearing Choices has a wide range of audiologists and staff. Their professionals have a goal to make hearing care easier to have – now more than ever before. With the web and expert knowledge about hearing loss, products, and treatments, Hearing Choices has their network of Aussie audiologists to provide you professional tinnitus treatment done right. Book a hearing appointment with Hearing Choices’s team of highly trained audiologists to counteract the effects of tinnitus tomorrow!